The Assault Rifle is an accurate, powerful, and fully automatic rifle that fires 5.56 rifle rounds. It has a moderate rate of fire which allows for proficiency at close to medium range. Strong recoil makes it more difficult to fire in full-auto at long range, but experienced users may be able to control it more effectively. The Assault Rifle is generally used as an end-game multipurpose weapon, able to take fights at any range. 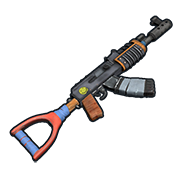 The Assault Rifle, more commonly knows as 'AK' is known as one of the best weapons in Rust. Capable of annihilating close range foes as well as mid-range with full automatic fire. AKs also do really well at long-range using tapfire, ak's are however somewhat hard to use as it has a rough recoil and a steep learning curve. AK is the most expensive weapon to craft. The AK is an extremely powerful and popular weapon in Rust for its versatility and the ability to beat most other weapons at close and far range. It is expensive with the 50 HQ and the rifle body requirements. For close range, recoil is mostly minimal and you will be focusing on the movement of an enemy when spraying at them. Unless absolutely necessary crouching is highly unadvised because of the slower movement speed making you an easier target and the unnecessary accuracy boost as the AK is very accurate even when moving and shooting. Below 30 meters this gun will take 4 chest shots to wound a person with any armor. Above 30 meters the amount of hits required rises up to 5-6. Depending on what helmet the target has, a head shot will do as much damage as 2 chest shots. Up to medium and long range you will want to avoid full spraying and shoot in bursts, not just to conserve ammo but also improve bullet efficiency and have a higher accuracy as the first few bullets are more accurate then the latter ones. Up to 100 meters it is beneficial to crouch however you will be vulnerable as it is easy to hit slow moving targets, even at long ranges. Bursting 3-7 bullets at a time are effective.